The Environment and Energy Study Institute (EESI) has issued this informative paper on recent congressional actions to encourage the development of resilient infrastructure. Natural and built systems that can better withstand severe weather and other hazards. Resilient infrastructure saves lives and property during catastrophic events, reduces the cost of recovery, and provides significant cost savings over the life of infrastructure systems. Climate-resilient infrastructure is designed and built with future weather patterns in mind, based on observed events, data and modeling. Even though the 115th Congress did not enact a comprehensive infrastructure bill as many had hoped, lawmakers passed and advanced several pieces of legislation that address resilience in homes, defense facilities, airports, and water infrastructure. Going forward, resilience should be a central goal for the new construction, repair, or modernization of any infrastructure project, from early planning, budgeting, and design, through the duration of a project’s life cycle. At a minimum, Congress can require resilience metrics and mitigation strategies for federally-funded projects. Prioritizing resilience in planning decisions can help meet the challenges posed by climate change-driven events, facilitate greater resource efficiency, and promote safe, healthy, and enduring infrastructure where people can thrive. Future infrastructure investments should reflect a triple bottom line of economic, social, and environmental sustainability in a manner that equitably serves the community. Policymakers are increasingly recognizing the tremendous cost of inaction in the face of more severe weather, such as floods, droughts, hail and wind, hurricanes and wildfires. According to the Government Accountability Office (GAO), federal appropriations for disaster relief between 2007 and 2013 increased 46 percent relative to the previous six years. In 2017 alone, the total cost of billion-dollar weather disasters was $312.7 billion, nearly a third of the total disaster cost since 1980 (adjusted for inflation). These costs to U.S. taxpayers, both measurable and immeasurable, will continue to mount if infrastructure is rebuilt to outdated standards. On the heels of an extremely costly year for disasters in 2017, Congress has shown increased interest in disaster preparedness and resilience, fueled in part by the unprecedented destruction and costs inflicted by last year’s multiple disasters, as well as by a new study from the National Institute of Building Sciences that indicates every $1 invested in resilience saves $4 to $11 in future disaster costs. Members of both parties are tackling the adverse impacts of extreme events through “must pass” legislation such as federal agency reauthorizations, spending bills, and emergency appropriations. However, additional action is required at the federal level to ensure public infrastructure policies reflect the threats of climate change and extreme weather events. This fact sheet explores how Congress is enabling states and localities to build stronger, higher functioning infrastructure systems, and suggests areas for further federal action. The costs and risks associated with extreme weather impacts are rising. Eight of the ten costliest hurricanes in U.S. history (adjusted for inflation) have occurred since 2005. Meanwhile, 14 of the 20 largest wildfires in recorded California history have happened since 2003. Altogether, 238 weather and climate-related disasters have met or exceeded $1 billion in overall damages in the United States between 1980 and 2018, with a total price tag of more than $1.5 trillion. 2017 was a historic year for extreme weather, with 16 ‘billion-dollar’ climate disasters. This record year tied with 2011 for the highest number of billion-dollar disasters in the United States. In total costs, 2017 shattered all previous records, with total damages due to disasters estimated to be $312.7 billion by the National Oceanographic and Atmospheric Administration (NOAA). Of this total, $270 billion was from Hurricanes Harvey, Irma, and Maria alone. Additionally, 2017’s Hurricane Maria, which affected the U.S. territory of Puerto Rico and St. John (U.S. Virgin Islands), was the deadliest natural disaster to hit the United States since 1900, with an estimated 2,981 deaths occurring in Puerto Rico in the six-month period following the hurricane, 22 percent higher than projected for a disaster of that magnitude. The 2018 National Climate Assessment warned that global sea levels have already risen by about seven to eight inches since 1900, with nearly half of this rise occurring since 1993. Under some scenarios, there is a possibility for eight feet of sea level rise by 2100, depending on factors such as Antarctic ice sheet stability. According to NOAA, this steady rise in sea levels is expected to accelerate over time. As of 2018, 22 of the past 24 years saw an increase in mean sea level relative to the prior year. Although eight inches may not sound like much, even a small, gradual increase in sea levels can pose significant challenges for coastal communities in the United States. Nearly 40 percent (123.3 million people in 2010) of the country’s population lives in high population-density coastal areas vulnerable to flooding, shoreline erosion, and extreme weather hazards. Additionally, infrastructure for transportation, oil and gas production, electricity generation, and sewage treatment situated near the shore is also at risk from sea level rise. A higher baseline sea level enables more destructive storm surges that reach farther inland. Meanwhile, instances of disruptive and costly “nuisance flooding” have become 300 to 900 percent more frequent than they were just 50 years ago. In 2012, Hurricane Sandy had a significant impact on several Northeastern states, causing severe interruptions to critical water, transportation, and electrical services, 159 deaths and more than $72 billion in damages. In 2017, Hurricane Harvey struck the city of Houston, resulting in 89 deaths and $127.5 billion in damages. Scientists anticipate that the coastal United States will likely see more frequent and intense flooding from storm events as sea levels rise. The U.S. Government Accountability Office (GAO) flagged climate change as a high risk to the federal government, beginning with its 2013 biannual ‘High Risk’ report and again in its 2015 and 2017 reports. According to the GAO, current and projected climate-related extreme weather events will result in increased fiscal exposure for the federal government. To mitigate this risk, the GAO recommends a national climate change adaptation strategy. Lawmakers can assist state and local resilience efforts by providing direct funding as well as research and technical tools and assistance. In addition, measures to improve national readiness and the resilience of federal assets will benefit all taxpayers. 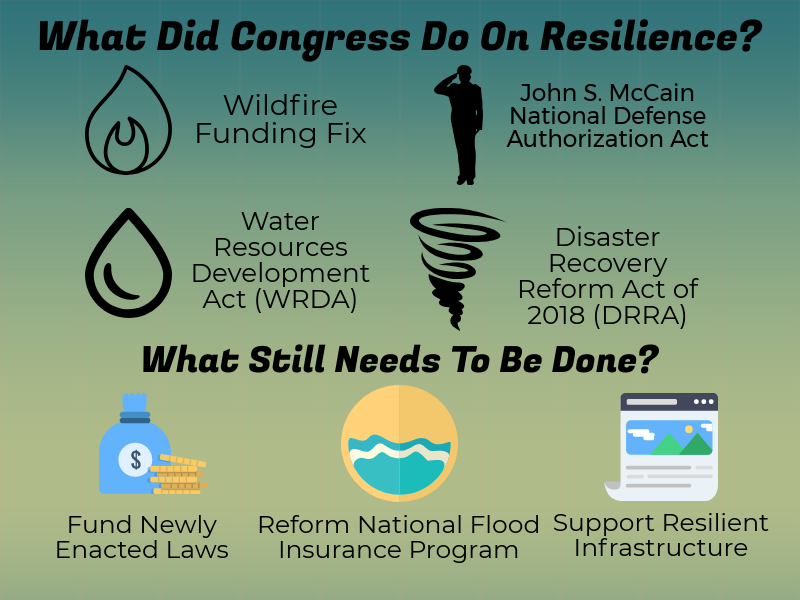 The 115th Congress introduced dozens of bills addressing resilient infrastructure and hazard mitigation, and several were signed into law, including annual appropriations for federal agencies and emergency spending for disaster response and recovery. The 115th Congress made important changes to U.S. disaster policy with the passage of the Disaster Recovery Reform Act (DRRA) that was signed into law on October 5, 2018, as Division D of the FAA Reauthorization Act of 2018 (P.L. 115-254). The legislation amends the Robert T. Stafford Disaster Relief and Emergency Assistance Act (42 U.S. Code, Chapter 68), which provides the statutory authority for federal responses and relief for major disasters and other emergencies declared by the President. DRRA’s amendments to the Stafford Act apply to every disaster declared on or after August 1, 2017. The Federal Emergency Management Agency (FEMA), within the U.S. Department of Homeland Security (DHS), provides the majority of federal funding to individuals and communities for hazard mitigation and disaster recovery. Other federal programs, such as Department of Housing and Urban Development (HUD) block grants and Small Business Administration (SBA) loans, also provide important services. DRRA has been called “transformational” for focusing more federal investment in pre-disaster mitigation (PDM). PDM grants are intended to help individuals, communities and states invest in mitigation strategies such as elevating structures, adding safe rooms, and implementing the latest building codes and standards. DRRA also includes funding for the National Public Infrastructure Pre-Disaster Hazard Mitigation fund, which will enable greater investment in public infrastructure mitigation before disaster strikes. And, the legislation makes an important change to existing law by allowing disaster-damaged structures to be rebuilt to the most recent model codes and standards. Section 1204. Provides hazard mitigation assistance to states affected by wildfires, whether or not a major disaster is declared. Section 1205. Allows hazard mitigation assistance to be used for activities that help “reduce the risk of future damage, hardship, loss, or suffering” in any area affected by a wildfire or windstorm. Some examples of mitigation assistance include the installation of resilient electrical transmission poles as well as the removal of standing burned trees. Section 1206. Authorizes assistance to state and local governments for building code implementation/enforcement and flood plain management. Section 1208. Requires FEMA to provide guidance and training to state and local governments, first responders, and utility companies on the need to prioritize assistance to health-care facilities to ensure they remain operational or return to functioning as soon as practicable during power outages caused by natural hazards, including severe weather events. FEMA must also help these facilities prepare for power outages through its local partners. Section 1209. Requires the administrators of FEMA and the Federal Highway Administration to provide guidance on the design, construction, maintenance, and repair of evacuation routes. Requires FHA to consider methods to improve the durability, strength, sustainability, and long-term cost savings of such routes. On public lands, resource protection must also be considered. Section 1211. Allows states to administer assistance for temporary housing and permanent housing construction. Requires FEMA to develop criteria for quality assurance and to review and approve applications for assistance. Sections 1234 and 1235 amend the pre-disaster hazard mitigation program to ensure investments are made to minimize loss of life from disasters and reduce the cost of disaster recovery. FEMA is required to issue a rulemaking that defines the terms “resilient” and “resiliency” in consultation with relevant federal agencies. Section 1240. Requires FEMA to provide a regular report to Congress on the instances when self-insurance amounts were insufficient to address flood damages, as well as the estimated amounts involved. Section 1241. Directs FEMA to coordinate with state and local governments and building design professionals to develop guidance and best practices for licensed architects and engineers to use when they assess structures after a disaster. Section 1245. Directs FEMA to provide a report to Congress on an Agency review of the eligibility process of the Public Assistance grant program for disaster-damaged underground water infrastructure. On October 23, President Trump signed America’s Water Infrastructure Act of 2018 (P.L. 115 – 270), which contains $6 billion in authorizations aimed at modernizing and maintaining drinking water systems, dams, reservoirs, levees, and ports. Among other things, the bill contains the Water Resources Development Act(WRDA). WRDA funds the work of the U.S. Army Corps of Engineers, which oversees the maintenance of a third of all U.S. waterways, and ensures development and maintenance of critical water infrastructure, including ports, inland waterways, bridges, dams, and flood control. Projects carried out by the Corps are expected to protect lives and property during severe weather events while also balancing economic competitiveness and ecosystem preservation. WRDA authorizes $3.6 billion for 12 Corps infrastructure projects around the country and 65 feasibility studies; however, Congress must then also provide appropriations for these projects. Currently, the Corps has a project backlog estimated to be as much as $100 billion, stemming from a lack of regular Congressional appropriations for Corps projects. Reauthorizes the Drinking Water State Revolving Fund for the first time since 1996, at $4.4 billion over the next five years. The revolving fund provides funding to states and utilities for drinking water infrastructure improvements. Requires assessments of drinking water system risk (Section 2013) and resilience to both natural and manmade hazards. Reauthorizes the Water Infrastructure Finance and Innovation Act (Section 4201), an EPA loan guarantee program that provides supplemental credit to significant water infrastructure projects around the country. In 2018, EPA received applications for more than $9 billion in WIFIA funds, double the amount available. Within the National Defense Authorization Act,† Section 312 expands DOD’s authority to “ensure the readiness of the armed forces … by pursuing energy security and energy resilience.” The bill gives the Secretary of Defense the power to implement metrics and standards for facilities to assess their energy resilience and requires DOD department secretaries to conduct “mission assurance and readiness assessments of energy power systems for mission critical assets and supporting infrastructure.” The provisions build upon existing laws that require DOD installations to abide by department-issued energy resilience master plans, in addition to the consideration of renewable and/or on-site energy sources in their cost-benefit planning. The section also requires the Secretary to include energy security and resilience goals for DOD in its annual installation energy reports going forward. In addition, Section 314 allows the Secretary to require that department secretaries and combat commanders consider the energy security, resilience, energy efficiency, and cost of backup options for systems and plans vital to military operations.The National Defense Authorization Act (NDAA) for Fiscal Year 2019 (P.L. 115-232) was signed into law by the President on August 13, 2018, having passed the House and Senate with strong bipartisan support. In the process of authorizing the Department of Defense’s (DOD) spending for the coming year, Congress once again included some notable provisions pertaining to national security and climate change. This trend began with the NDAA for FY2008 and reappeared most recently in FY2018, when Congress ordered DOD to submit a report detailing the ten most climate-vulnerable installations for each service branch. Provisions in the FY2019 NDAA focus on improving the resilience of DOD’s built infrastructure and its electric grid by better accounting for extreme weather events, documented flood plains, and future sea level rise. Section 1072 highlights the central role DOD resources often play in disaster planning and response. The language directs the Secretary to submit a report to the congressional defense committees detailing military installations that have been used by the Department of Homeland Security for disaster response within the past ten fiscal years, plus installations that may be available for such purposes in the future. Section 2805 orders the Secretary of Defense to require any proposed DOD construction project (requiring congressional notification or approval) to report on whether it would be sited within a 100-year floodplain, per available FEMA flood data. If FEMA floodplain data isn’t available for the risk assessment, DOD would be responsible for establishing an alternative process to complete the assessment. For sites within a flood plain, project managers would have to submit a risk mitigation plan, including a report on the project’s flood vulnerability and an explanation of why alternative construction sites were found unsuitable. The bill sets minimum flood mitigation requirements for all major or minor military construction projects in a 100-year floodplain, including the elevation of “non-mission critical” structures by two feet and “mission critical” structures by three feet above the projected 100-year floodwater level. Section 2861 establishes a 10-year Defense Community Infrastructure Pilot Program, which allows DOD to issue funding through existing federal programs (administered by other agencies) to help state and local governments address vulnerabilities or deficiencies in community infrastructure (transit, water, telecom, electric, gas, wastewater, school, hospital, emergency response) that may “enhance the military value, resilience, or military family quality of life” of a nearby military facility. Section 2865 extends DOD’s power to repair/replace access roadways serving federal military lands and defense industry sites to instances involving sea level fluctuation and flooding. The provision also allows DOD funds to be applied to infrastructure designed to mitigate flood risks to these roadways. A 2017 study estimated that coastal wetlands in New Jersey avoided an additional $625 million in direct flood damages from Hurricane Sandy. Increasingly, nature is seen as critical infrastructure. Natural systems, such as wetlands, forests, living shorelines, and healthy soils, provide clean air and water, help protect developed areas from extreme weather such as hurricanes, flooding and droughts, and provide climate mitigation by absorbing and storing greenhouse gases. Solutions that mimic nature—nature-based or green infrastructure—are those that “protect, sustainably manage, and restore natural or modified ecosystems” and can be applied in many contexts. Sustainable management of natural and nature-based infrastructure will protect lives, reduce the costs associated with extreme weather events, and provide critical wildlife habitat as well as recreation, tourism and other co-benefits. Forests provide multiple benefits to society—clean air, water filtration and storage, carbon storage as well as wildlife habitat, recreation and forest products. However, the capacity of forests to provide these critical infrastructure services has been strained by year-over-year increases in catastrophic wildfires, which have claimed lives and billions of dollars in property damage and suppression costs. The recent increase in wildfires is due to a combination of forces, including higher temperatures and pest infestations due to climate change, a long history of wildfire suppression, and surging populations in the wildland-urban interface. According to the U.S. Forest Service, 80 percent of U.S. freshwater supplies originate in forested land, and thousands of municipal water utilities rely on national forests for their water supply. Wildfires, therefore, threaten public water supplies, particularly in the Western United States. Wildfires also increase the potential for flooding and erosion, which can degrade drinking water quality and reduce water availability. While mostly taking place in the western United States, wildfire suppression in the last decade has affected forests nationwide by severely hampering the federal government’s ability to carry out regular forest management activities. Both the U.S. Forest Service (USFS), and the U.S. Department of the Interior (DOI) have reprogrammed funds mid-year to cover wildfire suppression costs, reducing their ability to carry out regular forest management activities (which could help reduce wildfires) as well as unrelated activities, such as road maintenance. Increasing the length of stewardship contracts (Section 206) from 10 to 20 years, as well as allowing the Forest Service to give priority to projects that promote innovative forest products, such as Cross-Laminated Timber. Emphasis on collaborative forest restoration (Section 605). These projects are developed in conjunction with federal, local and environmental stakeholders of local forest restoration projects and place emphasis on best available science and the retention of old-growth trees. Expansion of categorical exception from environmental review for certain hazardous fuel removal projects to expedite forest restoration in areas designated as having very high wildfire potential (Section 605). These categorical exceptions include projects up to 3,000 acres in areas of high fire risk and vegetation management around power lines. In addition to traditional water infrastructure projects, over the last decade, Congress has expanded the scope of the U.S. Army Corps of Engineers to include using natural and nature-based features. Restoring ecosystems to their natural states can often provide significant cost savings compared to traditional grey infrastructure projects. Additionally, these projects provide significant co-benefits such as flood protection, improved recreation opportunities, biodiversity, and water quality. The 2016 Water Resources Development Act (P.L. 115 – 270) defined a nature-based feature‡ as “a feature that is created by human design, engineering, and construction to provide risk reduction in coastal areas by acting in concert with natural processes.” Such features provide “flood risk management, hurricane and storm damage reduction, and ecosystem restoration.” It continues to prioritize the Corps’ use of natural and nature-based features and broadens the definition of natural and nature-based features beyond coastal areas to include risk reduction projects in all areas of the country (Sec. 1149). ‡ Nature-based features are sometimes referred to as non-structural infrastructure, green infrastructure, or low impact solutions. The Agriculture Improvement Act of 2018 (P.L. 115 – 334), also known as the 2018 Farm Bill, is a $428.2 billion five-year reauthorization of the U.S. Department of Agriculture (USDA) and U.S. Forest Service; nearly 80 percent of the cost of the bill is the nutrition program for low-income households (Title IV). The Farm Bill also reauthorizes existing programs, and creates new ones, that will help farms, forests and rural communities become more resilient to the impacts of climate change. The Conservation Title (II), Research Title (VII), Energy Title (IX), and Rural Development Title (VI) all include many programs that can help rural economies adapt to a changing climate. The largest resilience component is within the Conservation Title (Title II), which reauthorizes important programs that help farmers and ranchers implement conservation practices that build soil health and make their operations more resilient to drought and other climate impacts, as well as improving water quality and productivity. Notably, the 2018 Conservation Title includes a new Soil Health and Income Protection Pilot Program to establish cover crops that can build soil health. The Senate Appropriations Subcommittee Report (S.Rept. 115-138), associated with the Consolidated Appropriations Act, 2018 (P.L. 115-141), directs the Federal Highway Administration (FHWA) to submit recommendations to Congress for states, metropolitan planning organizations (MPOs), and cities to pursue resilient Federal-aid Highway Program roadways. FHWA’s report would also feature cost-effective solutions for bolstering the resilience of existing coastal highways. Finally, FHWA was ordered to expand its technical assistance and training workshops to help coastal states, MPOs, and cities improve their transportation planning and management, with an emphasis on reducing the life-cycle costs of coastal highways currently vulnerable to natural disasters. The Senate Appropriations Subcommittee Report (S.Rept. 115-268), associated with the FY2019 appropriations bill for the Departments of Transportation and Housing, included language directing the Federal Highway Administration to update guidance for its Emergency Relief Program to more fully account for resilient infrastructure practices and enable state-level transportation departments to better integrate resilience into their use of emergency relief funds. The Emergency Relief Program provides funds for the repair and reconstruction of highways and roads that have sustained serious damage from natural disasters, such as extreme weather events. This legislation updates programs and funding authority for the Federal Aviation Administration (FAA) for five years and also addresses resilience to extreme weather impacts and power outages at airports. Section 149 requires the FAA to consider the emergency preparedness needs of a community served by an airport when evaluating that airport’s master plan. Section 330 directs the Administrator to submit a report that identifies safety risks associated with airport power outages, recommends actions to improve resilience of aviation systems in such events, and reviews alert systems for pilots and air traffic controllers in the event of a failure of runway lights. Section 525 directs the Administrator to encourage the use of durable, resilient, and sustainable materials and practices including the use of geosynthetic materials and other innovations in carrying out FAA activities. Section 732 requires the National Oceanic and Atmospheric Administration and the FAA to jointly complete a study on the effects of extreme weather on commercial air travel. Ensure proper implementation of passed laws, including the Disaster Recovery Reform Act, the National Defense Reauthorization, and the Water Resources Development Act. Much can be accomplished towards ensuring climate resilient infrastructure by making sure programs are fully funded through the appropriations process and Congressional intent is maintained. Increase energy grid resilience. Today’s energy grid is facing multiple challenges. A number of bills were introduced in the 115th Congress to address the problem of an aging and increasingly obsolete electric power grid in the face of complex changes to the power sector, including incorporating distributed renewable energy resources, the need for high-capacity transmission and physical and cybersecurity features, as well as incorporating more “smart grid” capacity. Reliability and resilience are major issues, as energy providers and consumers struggle with extreme weather events that destroy energy infrastructure and create dangerous conditions and power outages. Reform the National Flood Insurance Program (NFIP). Intended to provide flood insurance at affordable rates to individuals living in flood plains, NFIP is due for reauthorization. Debate on the program’s future is expected to continue in the 116th Congress. Many policymakers and stakeholders would like to see broad reforms to the program. Currently, NFIP is financially insolvent, provides an unintended incentive for development in high-flood risk areas, and is unaffordable for many low-income homeowners living in floodplains. While human development has always faced threats from extreme weather, climate change is increasing the frequency and severity of such events. Building resilient infrastructure will protect lives, property, and foster a more sustainable environment and economy. In the face of increased uncertainty, resilient infrastructure will also better equip communities to bounce back (and forward) after an adverse event. The federal government faces tremendous risks from the rising number and severity of extreme events. While mitigating the causes of climate change— increasing greenhouse gas emissions—remains paramount, adaptation to expected climate risks through resilience planning in the Federal Code has become equally important. Legislation that advanced in the 115th Congress partially reflects this urgency, and more action on infrastructure and resilience is expected in the 116th. Indeed, policymakers are increasingly viewing climate adaptation as a risk management strategy to protect vulnerable sectors, according to a 2014 GAO report. The ability to adapt to climate change at the local level rests in part on continued efforts by the federal government to establish resilience plans, instigate and incentivize action, and to support ongoing state and local efforts. A coordinated multilevel government approach will ease the collective challenges of protecting the built and natural environment from climate impacts, to ensure society’s long-term safety and prosperity.